June 25, 2018: When it comes to bathing a baby and/or child, there is no right or wrong way; every parent has their own way. In fact, bath times in most homes become and remain as some of the best times for parents to connect with their kids. One of the most important aspects to ensuring a safe bath time is choosing the right products. There are many different types of baby wash available for parents to choose from which can prove to be quite overwhelming for parents looking for the right one for their baby and kids. 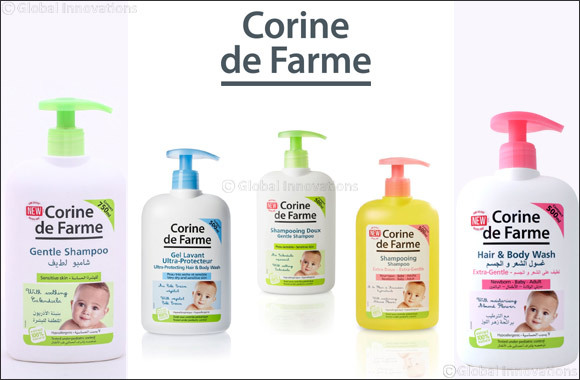 Corine de Farme products are formulated keeping babies in mind. The products are enriched with extracts that are 100% natural, and they help maintain babies’ fragile skin. They are tear free, hypoallergenic, paraben free, dermatologically tested, sulfate-free, lightly scented and of great value, which are all the characteristics of trusted products for babies, children and even adults! Here are a few essential picks when it comes to hair & body washes for babies & toddlers from Corine De Farme that are gentle and safe on the skin. soothing properties, doesn’t irritate and is ultra-sensitive. Leaves hair smooth, soft and lightly scented. This extra-gentle shampoo is ideal togently cleanse and to help detangle the delicate hair of newborns and babies. Its formulated without sulfates and soap-free, enriched with almond flower extract known for its moisturizing and soften-ing properties, respects the fragile balance of the scalp. Baby’s hair issupple, soft and lightly scented. The product rinses out easily and iseven suitable for daily adult hair washing! This ultra-protecting product is ideal togently clean, nourish and protect the baby’s very dry and sensitive skin from birth. Enriched with Vegetal Cold Cream –an exclusive Corine de Farme complex – renowned for its nourishing, protective properties and made from olive wax, shea butter, calendula extract and vegetal glycerin, it protects skin from dry-ness and it daily provides comfort. The baby’s skin is smooth, moisturized and delicately scented. is per-fect to very gently cleanse newborns’, babies’ and adults’ sensitive skin and delicate hair. Enriched with Almond Flower extract known for its softening and moisturizing properties, it reduces the risk ofskin drying out and leaves skin soft, moisturized and lightly scented. Hair is smooth and silky after use.